Raaga.com: Salman Khan’s song Main Hoon Hero Tera … seems the trump card for HERO’s success! 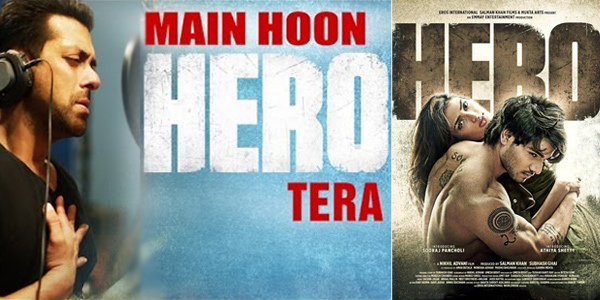 Salman Khan’s song Main Hoon Hero Tera … seems the trump card for HERO’s success! Wanna guess what is common between Subhash Ghai’s original HERO (1983) and Salman Khan’s remake version of HERO? Well it is hard to analysis because the present generation may be not aware that the highpoint of Subhash Ghai’s original HERO was a the soul string folk song 'Lambi Judaai…. ', sung by eminent Pakistani folk singer Reshma. The song was such a hit that it became a major attraction for the movie’s success. In fact when the film was released it failed to click in its first week due to its poor casting as both the lead actors Jackie Shroff and Meenakshii Sheshadri had the stamp of being flop stars. Meenakshii Sheshadri’s debut film PAINTER BABU and Jackie Shroff debut film SWAMI DADA had tarnished their images but Subhash Ghai had the guts to cast them. However to give a boost to his film he had included top stars like Sanjeev Kumar and Shammi Kapoor in key roles. Likewise it seems the saving grace for Salman Khan’s movie would be its song Main Hoon Hero Tera… sung by the superstar Salman Khan, who is also the producer of the film. According to reports the song has became literally a nation craze! Within a month of receiving six million hits on YouTube, Salman Khan’s song Main Hoon Hero Tera… has got over 14 million hits on the video streaming site! Starring debutants Sooraj Pancholi and Athiya Shetty, HERO releases today. While the film fraternity, who saw the movie at the farm house of Salman Khan has given a thumps up let’s wait for the Janta’s verdict!